The Czech Republic can be seen as an example of a region in which the agroforestry tradition was nearly completely lost due to political, socio-economical, and demographical changes. Agroforestry was a common land use in the mid-nineteenth century in Czech Republic. Fruit cropland, meadows, and pastures were closely bound with the highly developed agriculture of most fertile lowlands, while pastures, and meadows with wood use would occur more often in the mountainous forested regions. The most extended traditional agroforestry practice in Czech Republic is silvopastoral agroforestry system (grazing of extensive fruit orchards) remaining in sites with less favourable conditions for intensive agriculture (e.g. mountains – regions of White Carpathians and Bohemian Forest), but also game ranging in the private forests. There are also other agroforestry systems: trees on pasture (found in mountain areas – e.g. Jeseníky) and intercropping of forest trees and forest farming. Agrisilvicultural systems (intercropping under fruit orchards) is not very widespread in the Czech Republic, but nowadays some organic farmers are interested in this. We can find also few examples of forest farming/gardening scattered around Czech Republic, usually as hobby farming. Currently, there are not new intensive agroforestry systems (e.g. alley cropping) for timber production practiced yet. The total extent of agroforestry systems in the Czech Republic was calculated to be approximately 36,000 ha in 2018, which is equivalent to 0.45 % of territorial area and 0.8% of the utilised agricultural area. Czech Association for Agroforestry (CSAL) was formally established in 2014 The main objective of the organization is the promotion of agroforestry in the Czech Republic. Currently it has more than 30 members including people from academic and research organizations (focusing on agriculture and rural development) but also farmers. CSAL is very active in international level and work actively on networking in Europe and transfer of the ideas into the Czech environment. CSAL is the only NGO with the main objective to actively promote agroforestry in Czech Republic. CSAL firstly focus on building awareness among broad range of stakeholders working in rural environment about positive impacts of different types of agroforestry systems on their production and environmental services. CSAL specially focus on promotion and education of farmers, land owners or people working on farms to established and implement agroforestry systems on their landholding (e.g. creating guidelines for good management of several types of agroforestry systems). Third specific aim is to help create legal regulations related to agroforestry in order to break legislative barriers of growing trees on agriculture land, e.g. drafting of definitions, principles, framework for agroforestry in the Czech Republic and the development of strategic documents related to agroforestry. Fourth aim is to promote research in agroforestry in Czech environment, by networking the cooperation with research organizations, schools and farmers. CSAL also officially serve as coordinator of EURAF activities. Up to now the CSAL prepared several seminars and workshop for farmers and other stakeholders in agriculture and excursions that enables the farmer-to-farmer transfer of agroforestry technologies. The members prepared several papers explaining the concept of agroforestry that were published in journals focused on farming. CSAL cooperate with Ministry of Agriculture and Ministry of the Environment on preparation of legislative and strategic documents focusing on agroforestry. 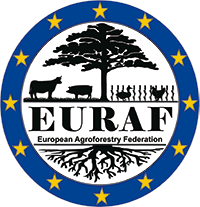 CSAL is also member of the team of ERASMUS+ project named Agroforestry Systems: The Opportunity for European Landscape and Agriculture (AGFOSY). Members of CSLA are also actively involved in the national project Agroforestry – potential for regional development and sustainable rural landscape financed by the Technological Agency of the Czech Republic. Current Czech land-use policy does not work with the agroforestry concept and plots managed, as mix of agriculture and forestry are rare and remain unrecognized by the cadastral land-use categorization. However, Czech experts on agroforestry proposed modification of the law to include into it agroforestry practices and this proposition was sent recently to the Ministry of Agriculture of Czech Republic for further validation. From the point of view of Czech law, the implementation of agroforestry is complicated. The Czech lawnumber334/1992 Coll. (law on the conservation of Agricultural Land) does not allow tree growing on farmland. However, there is one exception: use of agricultural land for plantations of fast-growing trees. However, the plantations of fast-growing trees can be grown on farm land maximally for 30 years. The Czech law number 289/1995 Coll. (the Forest Act) § 20, character n) The following shall be prohibited in the forest: to graze livestock, enable runs of livestock and punching of livestock through forest stand. Due to this law, grazing on forest land in the Czech Republic is impossible. The exception is game preserve of cloven-hoofed game and pheasantry. Agroforestry practice intercropping of forest trees is in accordance with the Forest Act of Czech Republic, but it is not almost used. Fig. 2 Short rotation coppice and Thanksgiving. Fig. 4 Example of traditionalagrisilvicultural practice in Drnovice. Fig. 5 – 6 Wooden eggs in the Czech way (Nová Olešná locality). Fig. 7 Founding new agroforestry (silvoarable) permanent research plot “Michovka” (Průhonice). Fig. 8 Plan of permanent study plot in University Agriculture Entreprise Žabčice (Mendel University Brno) – to be founded in 2019.